2019 is already heading to its second month, and that brings the perfect opportunity for organisations to self-assess and consider how they can better contribute towards the welfare of their work force for the year ahead. The quality of workplace benefits provided by an organisation can significantly improve the happiness and retention of existing employees. Likewise, when recruiting – the generosity of a benefits package will have a bearing on the appeal of a business to prospective candidates. Given the positive impact workplace benefits can have on employees, such as higher engagement and morale, it is imperative organisations get their offering right. Yet, according to research conducted by renowned recruitment company ‘Michael Page’, 64% of employees feel businesses are investing in expensive benefits that they neither want, need nor use. Interested in job satisfaction, training and qualification firm The Knowledge Academy analysed the latest findings from professional services company ‘Capita’, who surveyed 1,894 UK employees to better understand and discover the workplace benefits they most want. The Knowledge Academy found that UK employees would most like employers to have private medical insurance (42.7%) as a part of their benefits package. Thereafter, employees are keen to receive retail vouchers (35.0%) to spend at some of their favourite brands. Moreover, life insurance (34.5%) and private dental insurance (32.1%) feature prominently at the top of the benefits employees place a high value on. With people more health-conscious than ever before, it’s perhaps unsurprising 30.3% of workers think gym membership should be included in any benefits package offered by an employer. On the other end of the scale, gadget insurance cover (e.g. phones, tablets, laptops etc) is the least desired workplace benefit by employees in the UK at 16.3%. Slightly above that, 18.5% of British employees consider personal accident cover as an important inclusion in a company’s benefits selection. In addition to this, the Knowledge Academy sought to determine the benefits employees would be most willing to pay for out their own pocket if an employer did not have a given one. From this, travel insurance (43.4%) was established as the benefit workers would most pay for themselves if an employer did not make it inclusive in their benefits packet. 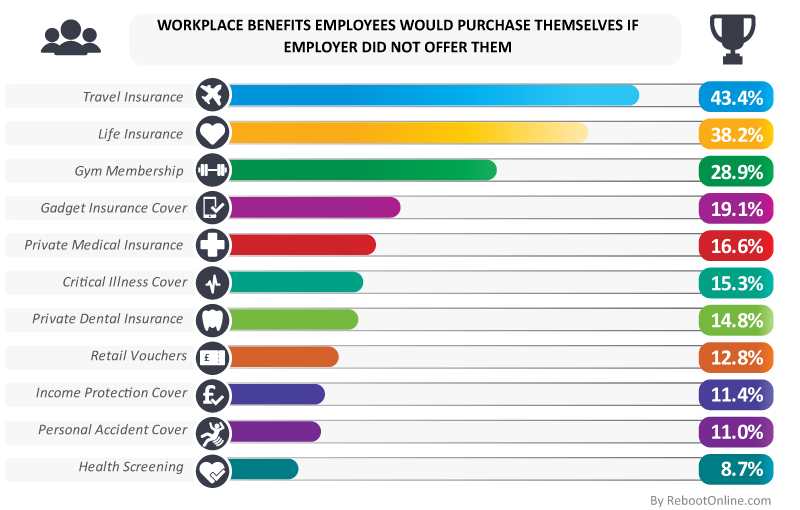 Life insurance (38.2%) and gym membership (28.9%) also ranked highly as the workplace benefits employees would be more than happy to splash their own cash on if an employer did not provide them. 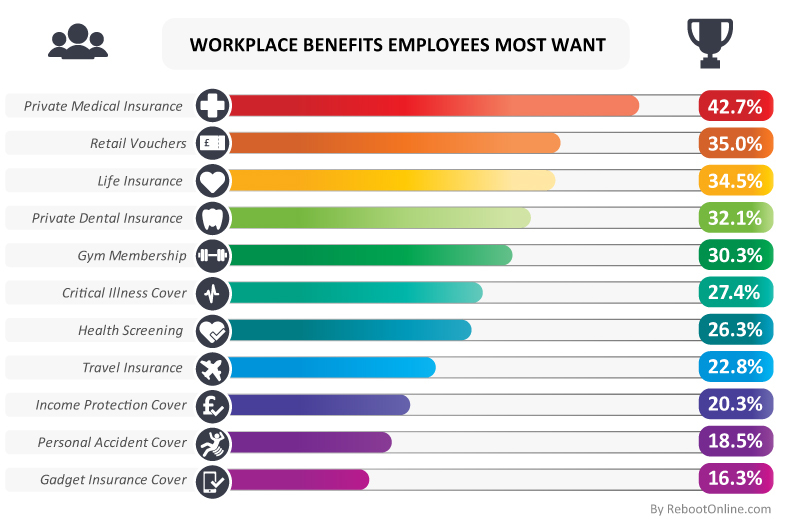 Despite being the two most wanted benefits, only 16.6% and 12.8% of employees would respectively get private medical insurance and retail vouchers if it meant dipping into their own wallet to do so. Contrastingly, even though 26.3% of employees would like their employer to give them the chance to get regular health screenings, just 8.7% would go to one on their own accord. Similarly, only a small percentage would independently fork out on income protection (11.4%) and personal accident cover (11.0%) – though neither had a huge demand from employees for companies to provide them in their benefits offering (income protection cover – 20.3% and personal accident cover – 18.5%) to begin with. Joseph Scott, a spokesperson from the company commented: “The professional working environment for many employees is more than just about getting the work in hand done and earning a salary. Alongside the enjoyment they gain from their respective role, how well they are treated beyond the monetary level contributes heavily towards their overall job satisfaction. Consequently, this research indicates that employers should be aware of this and aim to have a mix of lifestyle as well as insurance-based products in their employee benefits offering. Additionally, they should take the responsibility to make workers aware of all the benefits available to them and which ones would be best suited to their individual needs”.